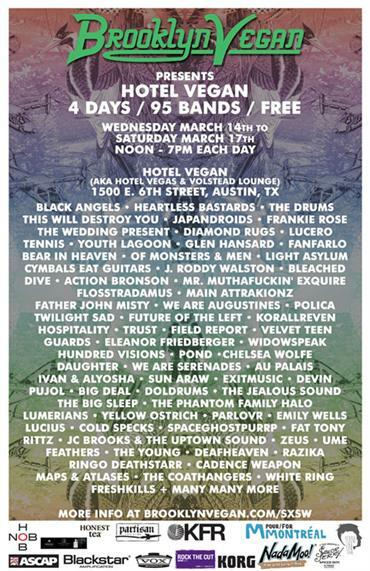 Metallungies goes back to SXSW 2012. Yo! I have a flight to catch in about 4 hours, yours truly is going back to SXSW. I’m currently shaking with anxiety, as there is so much to do so much to see, that I have oodles of content from last years SXSW that I never got to share with y’all (stay tuned I’ll probably crack open the vault real soon). Last but not very least is the Fader Fort by Converse, which has gotten so big that’s a Festival within a Festival, so meta. ML will be there a lot. Bet on it. You can see my sched.org schedule here. Which lists a majority of my picks in a nice, neat order. First timers tip: Sched.org app/schedule as well as the official SXSW app are must haves if you have a smartphone. If you are going, one word of advice, don’t run around from show to show, remember to have fun. I know it can be hard to fight off that FOMO (fear of missing out during SXSW). Be sure to follow on twitter: @Metallungies & on instagram: Dj01 for nonstop content overload through the week, I’ll try to post updates through the week here as well (crosses fingers for homeless wifi hotspot). Metal Lungies at SXSW Music 2011, Day 1. Big K.R.I.T. - 4Eva N A Day, Mixtape.